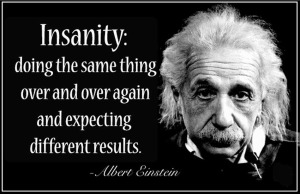 The definition of INSANITY was defined by Albert Einstein as ‘doing the same thing over and over and expecting different results. This may sound so simple, but most of us are caught up in the insanity. We all have those things we want to change about ourselves, about our life, etc., but we never seem to reach them. A good example in my own life, I remember when I was a young martial arts teacher. I had a very small class in a gym and I could never get past having 7 to 10 students. I’d have plenty of people come in and watch class, and I’d want to show them how good the class was, so I’d teach the most devastating techniques I could think of to show them how effective my martial art class was. And then, I’d wait for them to ask some questions at the end of class, but most of them were gone before the end of class, and the ones that stayed never asked questions. It wasn’t until a good friend of mine (We will call him Joe, because that’s his name) began walking over to them and introducing himself. He’d chit chat a little bit and the next thing I knew, there was another student of the floor. I had to ask Joe what exactly he was saying. I really wasn’t a communicator, but I decided at that moment, I’d have to learn. At first, it felt very phony. But, with time, I learned to communicate and loved talking to people. It became me. The insanity in that example was instead of trying something new, I tried harder at what was already not working. When you find yourself spinning your wheels and going no where, it’s a good time to step back, stop trying so hard at what isn’t working and try something else.